This part of my writings is an exploration of the true genius behind every idea that has ever appeared in earthly life. In particular it is about some of the groundbreaking ideas that already have changed our world and will keep on changing it, for example Christianity, socialism, communism and the evolutionary theory. It is an attempt at freeing humankind from some of the many false beliefs and prejudices about these themes that to this day are floating around in the consciousness of our world. Every creative idea originates in the masculine aspect of the Divine Trinity, God. He is the Creator whose ideas pass through the wisdom and love of the Goddess, His feminine counterpart. The wisdom of the Goddess knows when the time has come for new creations to appear anywhere, including our world. The Earth is one of the many manifestations of the God and Goddess’s co-operation. They perceive the images of their creative visions that concern us and our world through us. We are the dreamers through whom they are brought in being, in keeping with the great plan of life and the small plan for our existence within it. The Angelic hierarchy is the executor, guardian and caretaker of the plan. Without them nothing would ever come into being anywhere. The great plan provided that our race’s spiritual development should eventually reach the point when each through their own experiences had to find out what happens in our world when the masculine forces are given the upper hand and the softening and civilising influence of the feminine, the Goddess, are gradually withdrawn. As human beings can only learn to appreciate the value of something through having to do without it, there was no other way of providing us with this lesson. This is why the influence of the nurturing and caring energies of the feminine slowly had to be withdrawn from our world. And that’s what happened during the reign of a patriarchy that lasted around six thousand years, which turned into a time span of almost continuous warfare, suffering and destruction. The ambitions of the reigning warlords to gain the upper hand over other tribes, races, nations and their lands, possessions and people, became ever more cruel and bloody. Financing their enterprises was easily done by robbing and plundering our planet of its precious resources. On the upside, the by-products of warfare have always been the ideas the Angels provided for technical advances that would make Earth life easier and more pleasant, when yet another war had reached its end. The great plan decreed that when the patriarchy had run its course and sufficient lessons had been learnt, the influence of the feminine would return to our world. The wisdom and love of the feminine would then slowly steer it towards evolving into a highly advanced and peaceful civilisation that would have its foundations in the principles of the Aquarian spirit. This means true socialism with equal rights for all; one for all and all for one; everything is owned by everybody; everybody puts in as much as they can and only takes out what they need. Therefore, there is plenty for all at all times and no-one dies of hunger or thirst. Only highly evolved souls, whose sense of responsibility has fully developed, will be reincarnating into this society. They behave like true sons/daughters of the Highest and conduct their lives in keeping with God’s Universal laws. Being well capable of governing themselves and all aspects of their society, they no longer have any need for governments as they are known to us. Ideas for such a new golden age * with its ideal social order have for quite some time been flowing into the collective and individual consciousness of our world. The all-male energies of the patriarchy ensured that every wrong way would be explored first, so that in the end the Angels could guide us in the right direction. The crises that always have been rocking every aspect of our world from time to time have been and still are Universal teaching aids and part of the great plan. The dilemmas we encountered in the past and those that are turning up to this day have been and still are essential parts of the labour pains of our new world. These pains cannot be avoided in any birthing process, especially not when something on the scale of a new age’s is coming into being. Also, it needs to be born in mind that before spiritually anything new can come into being, that which went before it has to be broken down and removed. This is what’s been happening to us and our world for a long time. The above shows why all truly great ideas, for example Christianity and socialism, that are intended to shake our world to its foundations and change it profoundly, have to be seeded into the collective consciousness of our world a long way ahead of their time. This is necessary because germinating and then manifesting ideas of such magnitude can take centuries, sometimes thousands of years, as Christianity and socialism are clearly showing. When the first shoots of such ideas begin to sprout, they become visible in the form of many trial runs that allow us to try more and more wrong ways. Each one of them has to be explored first, so that individually and collectively we can draw the learning from the mistakes we are making along the way. This process continues until the first useful fruits begin to appear on our world’s tree of knowledge, so they can be used to assist that which started as an idea and a mere vision of a peaceful Earth to become a reality in our world. True Christianity is the purest form of socialism. Neither of them has as yet been practised on our planet. But every one of the wrong ways of trying socialism has always been taking us one step closer to this ideal kind of society, in which the Christ spirit wakes up in ever more hearts and souls and gradually takes over their whole being. When it comes to other human beings, we meet them as well as all other lifeforms, without any kind of distinction and prejudice, from the point of love in our hearts with kindness and patience, tolerance and understanding for each other’s foibles and the difficulties all human beings are bound to encounter on their pathway through life. We are helping each other to climb the hurdles that get in the way of the progress that is possible for us this time round. Giving to people instead of taking from them and exploiting them helps us to discover that being able to give and having something to share is much better way of living for human beings in earthly life. It means bringing God’s kingdom onto the Earth for everyone we meet. And that, dear Friends, is the real meaning of the second coming of Christ * as the saviour and redeemer of us and our world. The first one was the appearance of the Jesus legend as the Universal Forces’ teaching aid. The great plan provided that this would lead us to the discover that we ourselves are the only ones who can save and redeem ourselves, each for themselves, and that no-one is going to do this for us. True socialism and true Christianity will appear in our world together; the one without fail leads to the other. They are the road that takes us into the religion of the Aquarian Age *. The religions of the past have been of the head, but the new one is of the heart. It will rule our world with love and compassion, honesty and truth, mercy and forgiveness. Eventually all of us will be following it with integrity and loyalty to our own Christ nature. And regardless of where our destiny may ever wish to take us, we shall always be safely guided and protected when we follow the instructions of the living God within, our Highest Self. The Angelic forces are communicating with us through it. 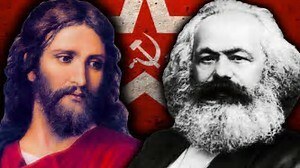 If Jesus really had existed, he would qualify for the title of the first socialist to become known in our world. With the help of the legend of this half human and half Divine being the Highest forces were seeding the idea of a new world order deep into the consciousness of our world. Alas, it would take approx. another two thousand years before these ideas could seriously begin to stir and eventually manifest themselves on our planet. I believe that, the more of us wake up to their true nature and strive to conduct our lives in keeping with the Universal laws, preferring peaceful and harmonious cop-operation with others to conflicts, the more peace will come to our world on the inner level quite naturally. As soon as something has happened there, it does not take long until it also manifests itself on the outer plane of life. Each one of us is required to make their contribution towards creating an increasingly peaceful world. This is the only way we shall finally free it from all manner of slavery and oppression, especially of the religious/spiritual kind, where warfare, violence and crime are no longer known. An important ingredient in the creation of our new Earth is that ever more of us are re-discovering and returning to the age-old natural healing methods. Until they were systematically suppressed and in the end completely wiped out by Christianity, they had been the domain of the nurturing and caring realm of the Goddess and the feminine. Now that our world has returned into the conscious awareness of the Great Mother’s presence *, wherever healing work is called for, the Angels encourage us to tune the transmitter/receiver stations of our earthly minds into the frequencies of the Mother’s white healing magic *. With its help all sickness and even death will eventually be overcome on the Earth. That’s how God and the Angels are patiently and lovingly guiding us step by step to our peaceful new world *. Without expecting anything in return, wise ones are doing their best to ease our planet’s birthing difficulties by freely and willingly serving the Highest and sharing their gifts with those who are in need of them. They are going to be rewarded by being allowed to take part in earthly life when the transformation is complete. If they so wish, that’s what they can do for a while. Then they will be free to move on to exploring the higher and eventually highest levels of life.